I wonder what gave me away – the olive at the bottom of my “water bottle” on Tuesday? Last Thursday’s festive paper umbrella perched atop my Core Power protein shake-arita? Or maybe it was yesterday when I stumbled into the Razz M’Jazz spin class and vomited all over spinstructor Rogelio’s 60-mph front wheel, effectively spraying the entire class with Grey Goose and Vanilla Creme Muscle Milk. And corn dog chunks. 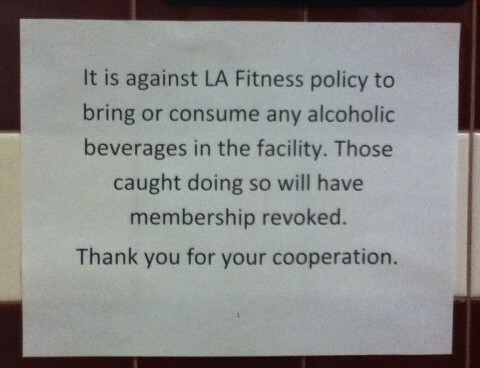 Regardless, I guess it’s back to alcohol-loading in the parking lot before I begin my workout, like you X90P people. Posted by Ted on September 26, 2014, 6:17 PM.